196ml hexagonal clear glass preserving jars in a 12 pack. 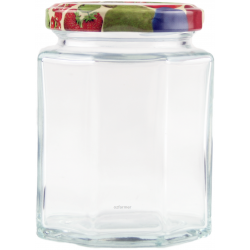 These jars are the perfect size for jams, chutneys and pickles. Take a size 58mm lid available for purchase separately click here. These jars look smart and beautiful. With a capacity of close to 200ml it is a perfect size for so ..